There’s nothing better than seeing members of the Threadcommunity grow along with their styles. And Nina Palomba is a prime example! We were first brought into “Nina’s World” at our old space where she left us with an awesome mural. Since then, Nina has moved from Chicago to L.A where she’s continuing to use her positive art style to spread messages of joy and love out West. 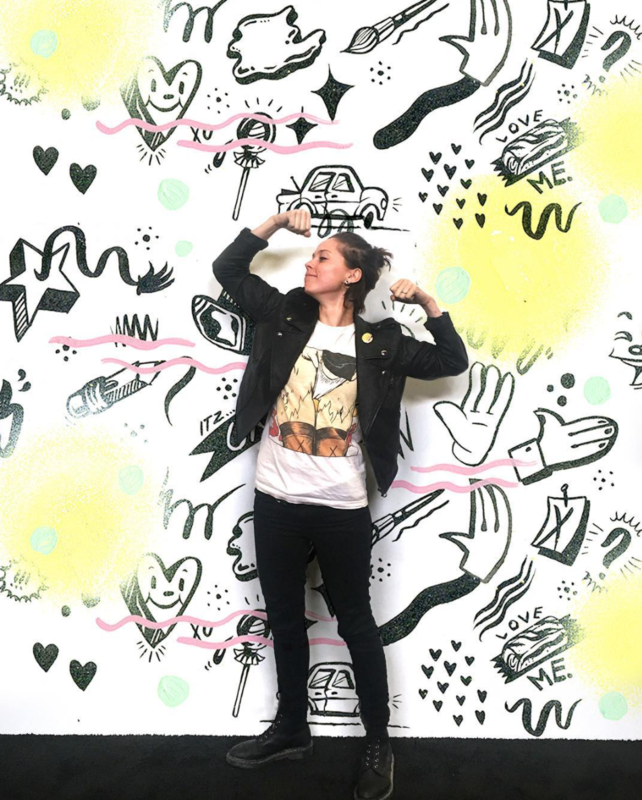 And we were lucky enough to have her come back to Chicago to spread some good vibes with a mural in our new space! 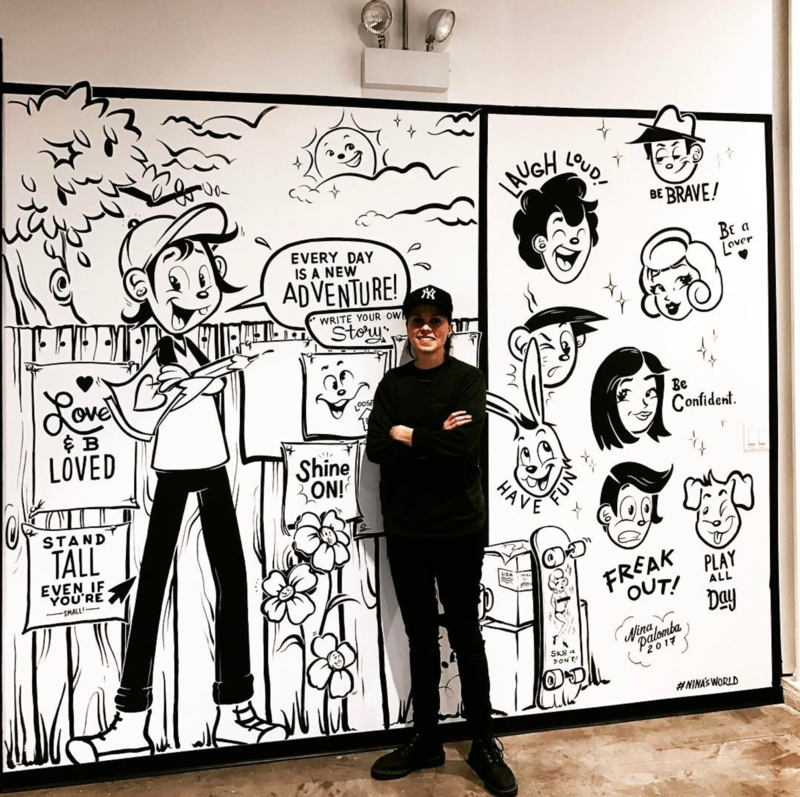 We talked to Nina about the move from the midwest to the West coast, her brand new Artist Shop, her phrase “love and be loved”, and, of course, about the new mural she left us. Check out the interview below and be happy! 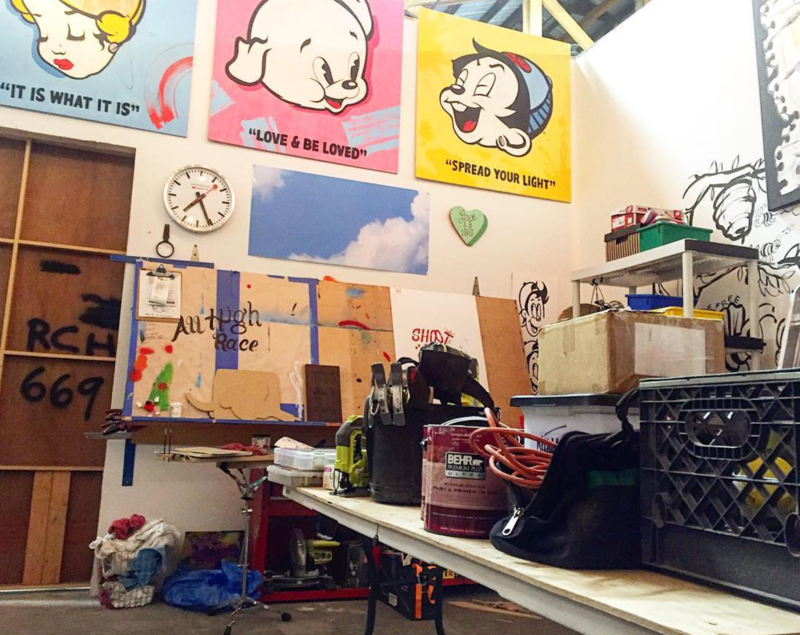 We actually interviewed you on the blog when you did a mural at our old space! Back then, you were based in Chicago – how have things changed since then? Things have definitely changed a lot since moving from Chicago to Los Angeles! It’s been quite the adventure. Nina’s World has evolved beyond paint and into miniatures and large fabricated work. I’ve been working in Art Direction and Production Design as well, which has been amazing and has inspired new themes in my work as well as my journey as an artist. We’re so excited about the new mural you just completed in our new space! Tell me a little bit about your process for designing this one! 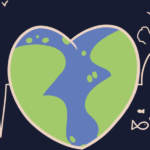 I wanted to make something fun and community-based for Threadless. I’ve taken on a bigger role in creating work that incorporates everybody lately through an interactive element and I really love it. 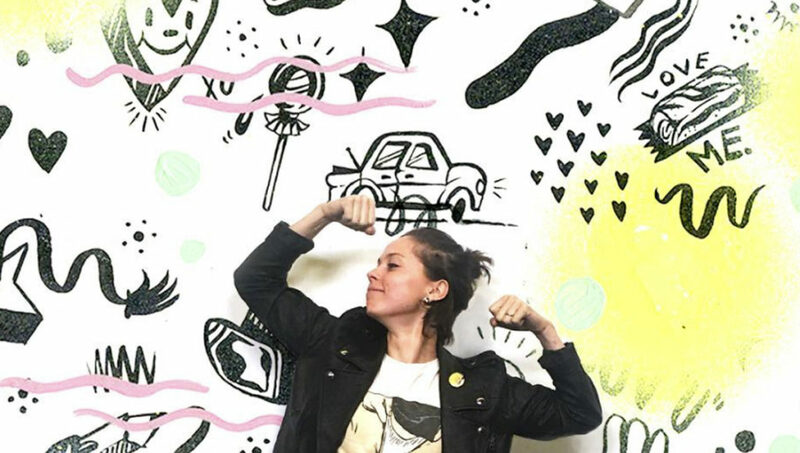 The wall at Threadless was the perfect spot to make something that everyone can be a part of. The hope was to inspire people to share there stories or notes with each other to spark conversation. Being able to paint murals to me is such a privilege; you get to have your work seen by so many people, but with that said you have to be more aware of the imagery you put into the world. This has made me more conscious of my work and the meaning behind it. You have a section on the mural where you left space for us (and anyone!) 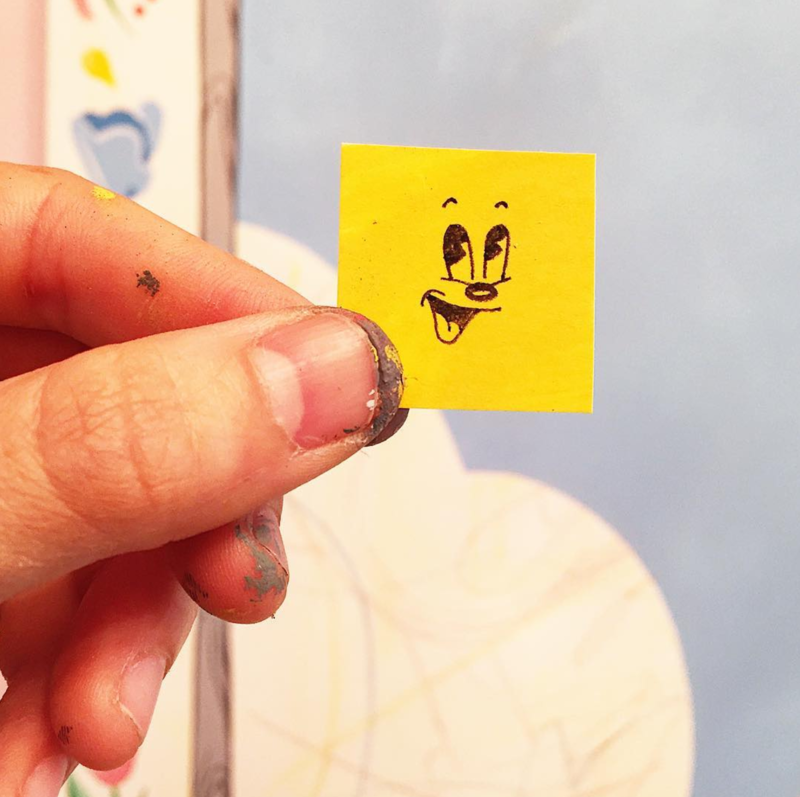 to leave positive messages – is spreading good vibes a big part of your style and work? Yes! Continuing with the last question, spreading positivity through color, humor and imagery has become my focus in my personal work. The sayings in my work that pop up often are “Love and Be Loved”, “Shine On”, and “Spread Your Light”, all in which were originally derived from post-it notes I was writing to myself to keep my spirits up years ago. The notes became an illustrated part of my painted work and through life and through my painted journey have manifested into a solid part of my painted messages and Nina’s World. 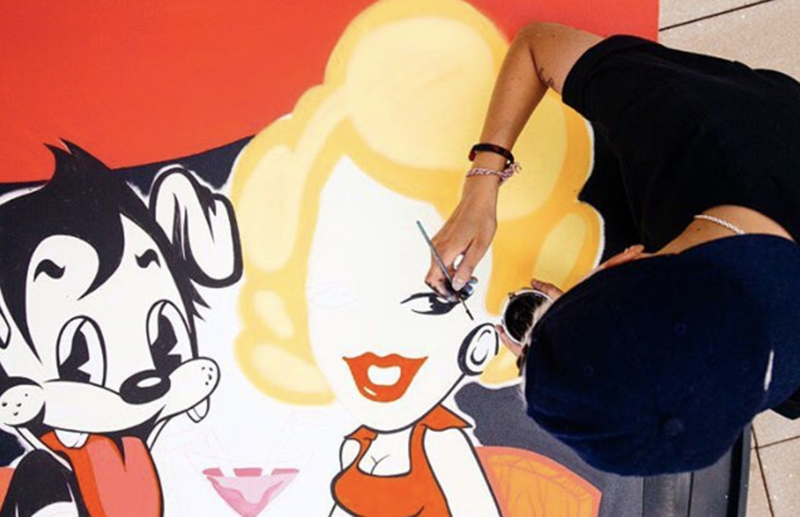 Your style is very reminiscent of classic cartoons like Betty Boop – are classic cartoons a big source of inspiration for you? Where else do you draw inspiration from? I love Betty Boop! Max Fleischer and the early years of cartooning are a key source of inspiration for me and have been since I was a kid. Walter Lance is one of my favorite cartoonist along with Alex Raymond. Together, their life’s work is a continuous stream of inspiration for me as well as a reminder to never stop making. I subconsciously am inspired by lots of things throughout my days. I have a photographic memory, so things tend to stay with me for a while and come out in unexpected moments. Like a mental snapshot of a beautifully painted “S” on an old sign, or a funny hand-painted Mickey Mouse out side of a party supply store. My work starts very intuitively, so once I put my brush to paper, things just start flowing in a sense. 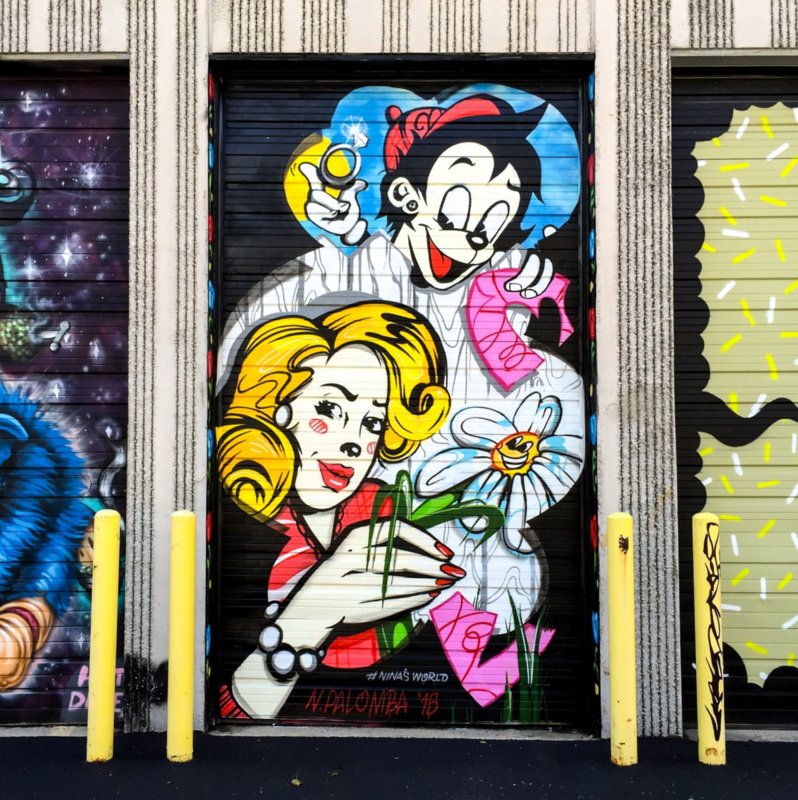 How did you get so involved with the street art and mural scene in Chicago? How has Chicago influenced your art? While in Chicago I fell into the street art scene pretty randomly. I was doing street art here and there, but was primarily focused on comics and making zines. I got the opportunity to work closely with a street artist as their assistant, painting not only studio works, but large murals. From that, I fell in love with using spray paint, as it was a means to paint very large-scale works. From that, I landed a job painting ad murals with spray paint and that sent me further into developing my skill set with cans and taking my work to another scale and into the realm of street art. “First Kiss” of Nina and fiancé Miss Tosh, via Nina’s Instagram. Do you have any recurring characters in your work? Most of my characters are recurring. My fiancé Miss Tosh and I are definitely lead characters, as well as my younger sister, puppy Winky, and a random bunny (I’m not sure where he is inspired from). My painted work is what I like to call a Comic Diary, and tends to be an illustrated narrative of my life. As things unfold in my day to day, they end up characterized in paint on canvas. My characters do, however, take on different styles. Right now I’m working on more illustrated female characters, which is taking my style in a little different direction, but all the same world. From a mini set! Via Nina’s Instagram. 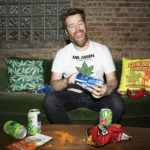 Your site says you work on stop motion and set design – tell me a little bit about how you got into this type of work! So I have a degree in fabrication and having grown up working with my father in his wood shop, building things has always been a passion of mine. Over the past five years I have been working primarily in paint and fabrication on the side. After moving to Los Angeles, I was seeking opportunities outside of the world of painting, just looking to shake things up a bit. I was fortunate to get my foot in the door out here in commercial work and have been able to work my way up to doing production design for commercials as well as art direction and fabrication. I’ve worked on several stop motion commercials, including a couple for Honda and Mac Cosmetics. Beyond that I’ve done work with Disney, Universal, Marvel, Dreamworks, and Mattel, all various types of work including making photorealistic sets, to backdrops, props and even a couple murals. 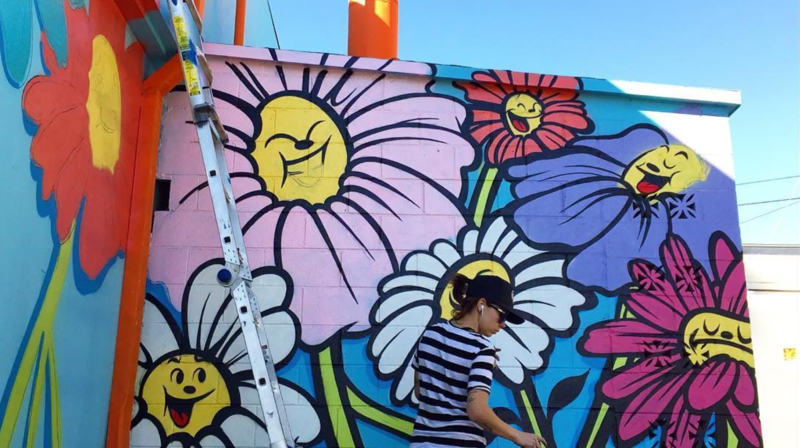 Nina working on a new mural in Hollywood, via Nina’s Instagram. I’ve found a good balance working both in my painted world and the commercial/entertainment industry; it allows me to flex my creative muscles in different realms while being able to make things nearly everyday. Tell me about your Artist Shop! How did you choose the designs to put in it? I’m super excited about my Artist Shop! I feel it is great timing to release all of this, which is great. The designs that are up are bits and pieces from paintings of mine that I thought stood well on their own. I wanted to create a collection of sorts verses just putting my paintings on shirts. The shop is curated to an extent so the products available are all within the parameters of my brand. 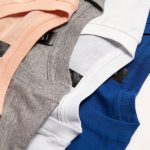 No crazy neon pink shirts in Nina’s World; mostly baseball tees and grayscale. 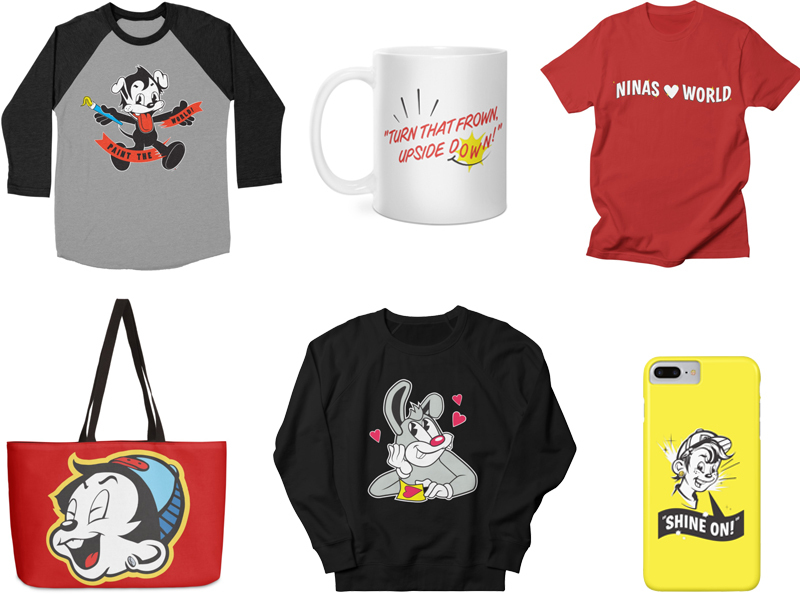 Top row: “Paint the World” on a baseball triblend, “Turn That Frown Upside Down” on a mug, and “Nina’s World” on a men’s tee | Bottom row: “Laugh Loud!” on a weekender bag, “Lucky Bunny” on a sweatshirt, and “Shine On” on a phone case. Have you sold your work on apparel before? Do you have a favorite design in your Shop? I have sold work on apparel before but haven’t in a while. When I was in college I actually ran a streetwear brand that sponsored skaters and BMX riders. It was a ton of fun, we sold apparel all over in skate shops and online. 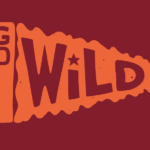 When I was in middle school I actually ran my own customized t-shirt company too! I did hand-painted, toony shirts for people. So yeah, I’ve always loved shirts! 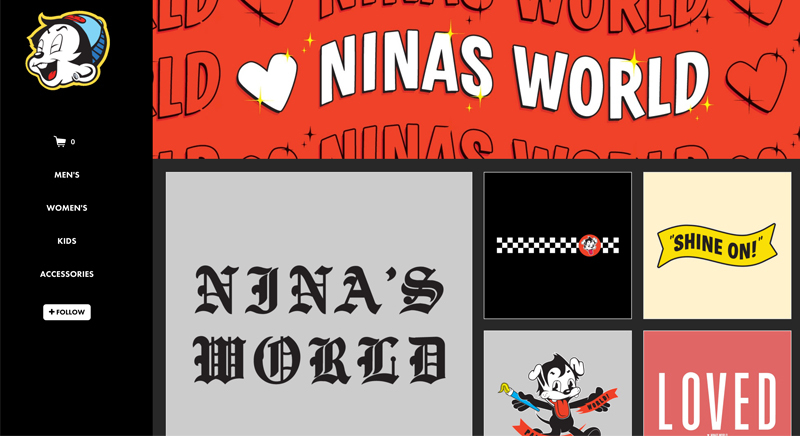 I’m excited to have a concrete shop up now though where people can get some fun Nina’s World things and expand my brand beyond selling paintings. 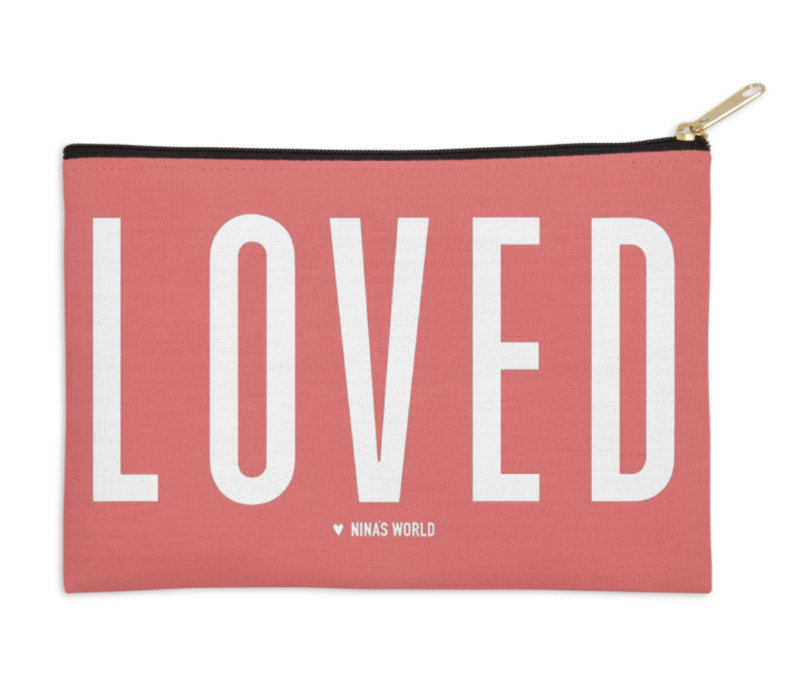 “Loved” on a zip pouch. “Love and be loved” is a phrase that comes up consistently in your work – when did you start using it? “Love and Be Loved” is definitely one of the most common phrases in Nina’s World. It came out of a tough moment in my life maybe three years ago now. I was listening to “Nature Boy” by Frank Sinatra in my living room after a long day. I’d listened to this song many times before but for some reason that day the lyrics stuck with me profoundly. “The greatest gift you’ll ever learn, is to love and be loved in return.” At that point in time, it was exactly what I needed to hear and a week or so after that, I painted my first “Love and Be Loved” mural. It has evolved a lot since then and has remained a daily notion for me to project love in my life and in things that I do. The design I have with the hand holding the sign saying “Love and Be Loved” has become a big graphic for me. I’ve been pushing it publicly and trying to get it out there. Last June I painted the first rendition of that design as a mural here in Los Angeles. That was around the time of the Orlando Massacre, and I felt I had to make something not out of anger or hate, but love. That moment catapulted me into taking public art to a whole new level beyond what I was already doing. It gave me a focus to project love in my painted work. I actually submitted that design just before I painted that mural in June to the city of Los Angeles, along with a proposal and entire application to be a registered artist here in LA, thats the only way you can paint with a permit here. This past week, I finally got the opportunity to speak in front of the entire Arts Council of Los Angeles at City Hall about my design, what it means to me, and why I think it should be a part of Hollywood. This was a huge moment for me because I think above everything, I showed myself what my art really does mean to me, and how far I would go to paint something I believed in. Long story short, they approved that design and we are moving forward to find city walls to paint it on! I’m aiming to turn “Love and Be Loved” into a campaign that in hopes will move across the country to be painted in all different types of neighborhoods, with all types of communities to get this simple message out there. That simple phrase has done a lot for me and has triggered a drive to go one step beyond with my art. Thank you Threadless! You guys have been able to firsthand see my creative journey unfold and I’m excited to get the Artist Shop up and going! Posted in Blog, Spotlights and tagged nina palomba, Nina's World\. Bookmark the permalink. FIGHT! What Marvel and Non-Marvel Characters Should Face Off?